I used Zoya Posh Matte Velvet as a base, and Zoya Dakota with Konad Plate m63 for the designs. 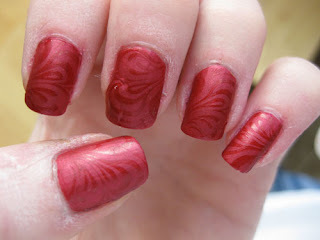 It sort of brings the 'Matte Velvet' to a whole new level- it looks like rippled pieces of velvet! 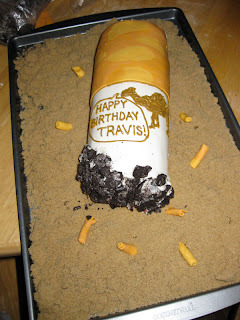 I had to make this cake for my friend Travis' birthday today! Oh wow thanks!! :) I really appreciate it!! Beautiful mani! That is one heck of a cake! Although be warned, they make it very easy to laugh until you weep. Thanks Mighty Lambchop and Anon! Anon: I LOVE that site, its part of my morning routine, I check it every single day! I love her commentary. Amazing cake! :) What did you use to make the ash? That cake looks amazing! Does it taste like a ciggy, too? I just found you today through metafilter. Did you know they posted a link to your blog? You have already made it into my very small list of favorite nail polish bloggers!